So I have been going to aqua classes 3-4 times a week. Friday- Walking OR aqua depending on the weather. Sat- aqua when I can. (depending on the teacher)If I didnt feel like I got "enough" out of it I will stay for half of the cardio aqua class that is mon, wed, fri.
there is only 2 hours of child care available at a time and I need to have time to get showered etc after class. I also just took my first Trainer Session 2 days ago. oh man - that was rough. good, but im still sore. I just have to say - Planks hurt! but imagine my core /ab muscles after a while! I think thats whats hurting the most and a bit of my legs. She wants me to do this twice a week as well as my aqua classes. She knows I like them better so she wants me to keep going to them since I enjoy them. (I get a good workout when she is the teacher of that class! 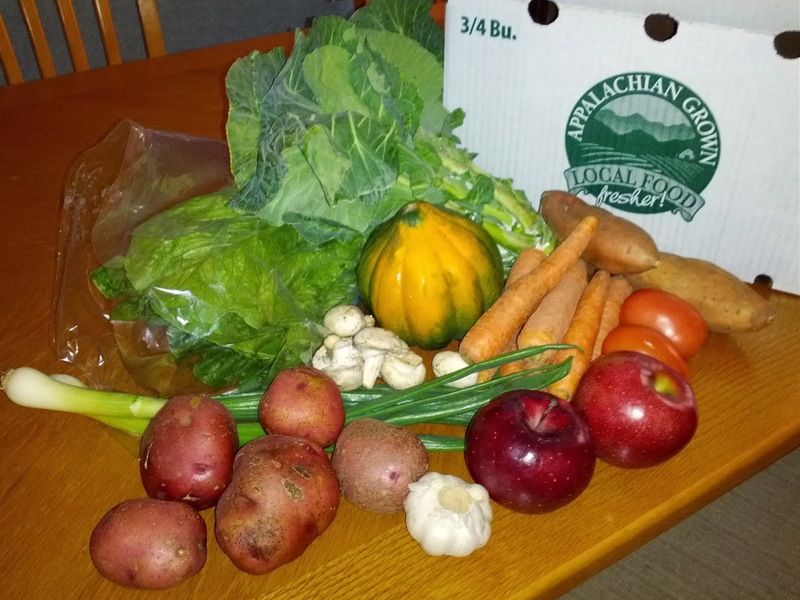 I got a box of produce from Wild Pilgrim Farmstead. They are a first generation farm providing produce to locals. We love the simple things in life! We enjoy spending time with our family, growing quality food, and creating artisan products from our farm. We are not certified organic, but use organic practices in growing our fruits, vegetables, and meats. We raise entirely grassfed Beef and Lamb. During winter we feed certified organic hay from Reedy Fork Feed in Elon, NC. We are an Appalachian Locally Grown Certified farm. This certification means our farm has been inspected and that we actually grow what we sell. We are also vendors at the Watauga County Farmers Market in Boone, NC. This is a 100% locally grown market. To be a produce and meat vendor you are required to raise 100% of what you sell. The market manager visits each farm to verify this when a farm becomes a member of the market. Our farm supplies Year Around Produce using OMRI approved methods through the use of Heated High Tunnels, Unheated High Tunnel Greenhouses, Low Tunnels, Field growing, and Frost Blanket coverings. We also raise grass fed beef and lamb. Our added value products include Pickles (we are a certified acidified foods producer), Cajeta Mustard (goats milk caramel mustard), gourmet jams and jellies. Its kinda fun getting a box of stuff and to think what you might use them for! any recipe suggestions for using these ingredients? So thats where I am right now with that. 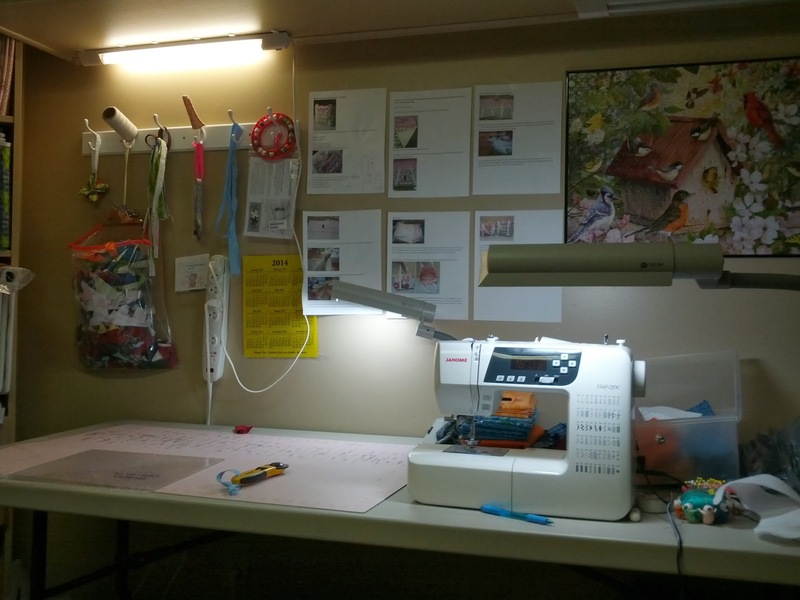 For my sewing- I still haven't done a thing with my bed quilt but that doesnt mean I havent been sewing for me. I have been making a few bags for aqua class. They have been kinda popular at class and a couple people have asked me to make them some! Oh- and the other thing is the Housekeeper- so far so good! I think every other week is about as long as I can go before the house becomes a disaster area. She has been here a couple times and It makes me happy to have her around! Shoot- looking at the list from January - I still need to call about my wisdom teeth! I attend a bible study weekly that has a 5 day homework component. I have been really bad about doing the homework in 3 days instead of over the 5 days. I still do not have a good personal devotion time. 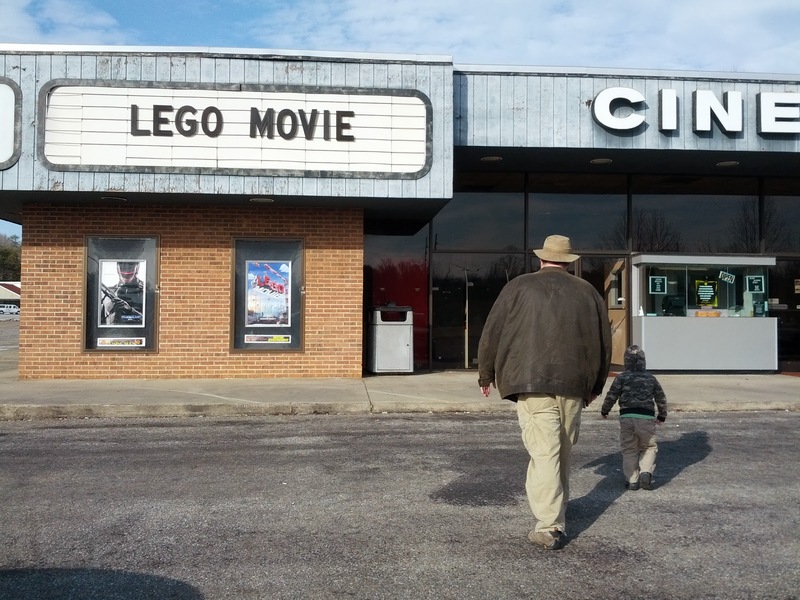 Zeke got to go to his first "real" movie today. 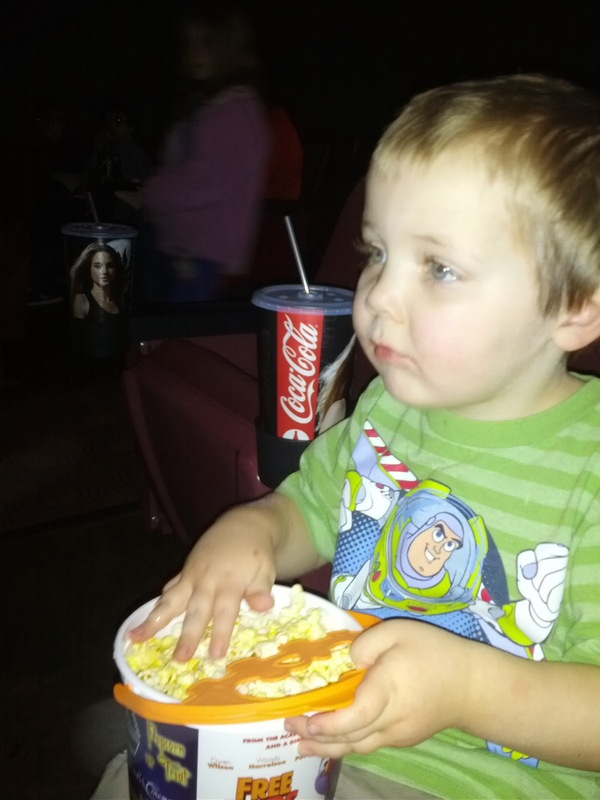 alright- he has been in this theater before to watch older movies for the summer rerun program they have for kids. But this was on the release day even! We got a sitter for Abigail and +Dave DeBaeremaeker and I took him to the theater. Guess what was worth taking a 4 year old to? Zeke was enthralled (and this was during the trivia stuff) and also ate the whole bucket of popcorn! but it was too small. I also used some leftover fabric for a pocket. As with most things I tried something new with this bag. I decided to use fusible fleece instead of batting. not sure the sides are as stiff as I would have liked. but thats not a problem. I took my pocket material and lined it up and then sewed it down the middle. I then made some pleats for pockets to hold more. I read a tip somewhere about working with vinyl covered cotton was to put the satin scotch tape over your foot and on the plate- leaving room for your feed dogs. I then sewed down to create the pockets. 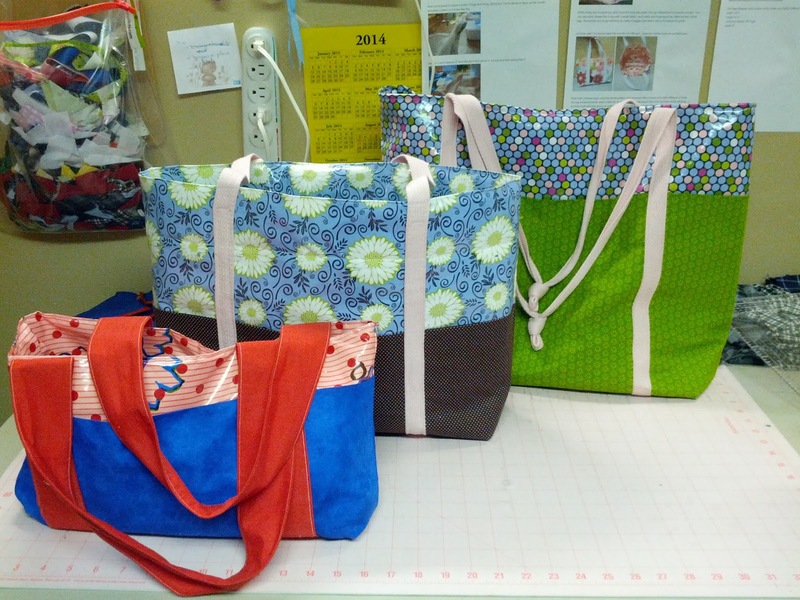 4 wide pockets and 2 flat pockets. so on the other side I did the layering and sewing on the handles. I also sewed about 4 inches up from the bottom so the pockets didnt go all the way under the bag for me to loose stuff in. Using some heavy duty Heat and Bond I stuck a piece of Peltex Ultra Firm stuff for the bottom. And I think it really is too big. The strap is too long. I think using 3.5 yards and cutting that in half would have worked out just as well. I do like the peltex at the bottom and the pockets. I should have made the pockets a bit lower so they would have sat closer to the bottom. Thats only because the shampoo etc I put in them weigh it down. and when I set it down- it collapses inward.